Who Says big action lies beyond the range of average fishermen? Not with today's Sea-Horses! 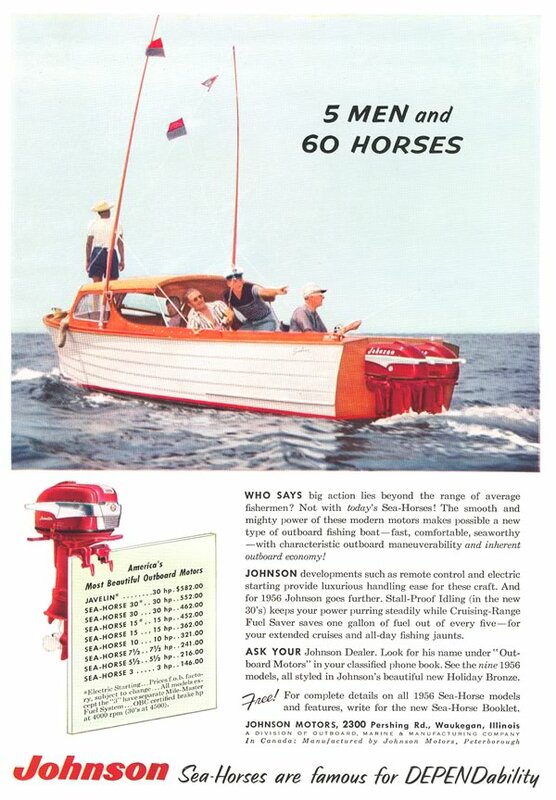 The smooth and mighty power of these modern motors makes possible a new type of outboard fishing boat - fast, comfortable, seaworthy - with characteristic outboard maneuverability and inherent outboard economy! Johnson developments such as remote control and electric starting provide luxurious handling ease for these craft. And for 1956 Johnson goes further. Stall-Proof Idling (in the new 30's) keeps your power purring steadily while Cruising-Range Fuel Saver saves one gallon of fuel out of every five - for your extended cruises and all-day jaunts. 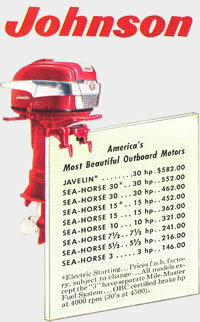 Manufacturer: Johnson Outboards, Waukegan, Ill.